The Stingray Diaries is a research project focussed on the conservation management of Australia's rays. ​to build our understanding of the behaviour and ecology of our endemic rays. It has been estimated that almost 35% of all shark, ray and chimera (class: chondrichthyes) species are threatened with extinction. Further, large, shallow water (coastal) species are at the greatest risk of threatening processes, due to their heightened exposure to human activity and human-threats, such a fishing, habitat modification, and pollution. Many species of rays, sharks and chimeras also have a number of traits that make them particularly susceptible to threats. Many are slow growing and don't reach sexual maturity until they are many years old. For example, great white sharks may not reach sexual maturity until they're over 30 years of age. When they do breed, there are also many species that only produce very few, well-developed young which take a lot of time and energy to produce. This also means that there is often a long time between litters. For example, grey nurse sharks only breed every 2 to 3 years, and when they do they only have 1 or 2 pups. These traits hinder the ability of these species to recover if the population is reduced because recovery takes a very long time. As a group, rays are even more threatened than sharks, with 5 out of the 7 most threatened families being rays. In addition, our knowledge of the basic biology, ecology and behaviour of rays is lacking, with 40% of species listed as 'Data Deficient' on the IUCN red list of threatened species. This means that there is not enough data on these species and their populations to be able to make an assessment of their threatened status. It is likely, that many more species of ray are threatened with extinction than we are aware of. Threatened status of the worlds rays. 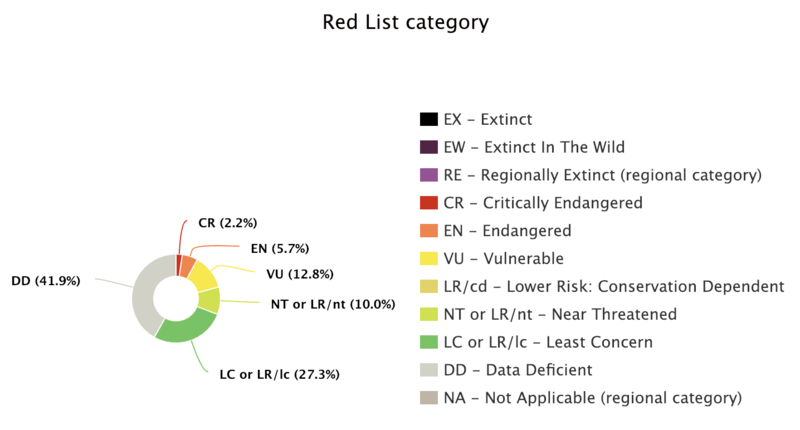 From IUCN Red List of Threatened Species. Smooth stingrays are Australia's largest species of stingray. They can grow to a whopping 4 meters in length and almost 2.5m wide, and weigh up to 350 kg. They're a common coastal species in southern Australia, as well as New Zealand and South Africa. While they are not considered threatened, being large coastal rays they do come into contact with a lot of human activity and human-induced threats. This makes them an excellent model species for studying the biology and behaviour of large, coastal rays in a hope to inform better conservation management. Despite being common, we actually know very little about them. Only a handful of studies have researched their biology or behaviour, and these were based on only a few individuals, mostly in New Zealand. There is plenty to learn and that is one of the main aims of the Stingray Diaries Project. In southern Australia, smooth stingrays are most often seen scavenging fish scraps discarded by anglers at boat ramps and piers. These areas are usually bustling with people fishing and boating, and fish scraps are discarded into the water to be picked up by the rays. It is largely considered that this activity is ecologically benign. That is, throwing fish waste back in the waters is ok because that's where it came from. In reality though, food provisioning of rays and sharks for tourism has been shown to impact the behaviour and overall health of the species being fed. While the amount of fish being fed to the rays at boat ramps and piers is small by comparison, there has been no assessment of whether this incidental provisioning has an impact on the animals feeding on these scraps, and considering that this occurs all around Australia, and the world, the overall impacts may be significant. In addition, being attracted to these areas of high human activity may expose the rays to more risks from human activity, such as boat strikes and fishing entanglement. The Stingray Diaries project therefore also involves the assessment of the impact of these interactions with humans on smooth stingrays and their movement patterns. In Jervis Bay and Bendalong on the south coast of NSW, smooth stingrays are a common sight, cruising the shallows or feeding on discarded fish scraps at the local boat ramps. The majority of Jervis Bay is part of the Jervis Bay Marine Park, which is managed by Fisheries NSW. As part of their management of the Jervis Bay Marine Park, Fisheries NSW maintains an extensive acoustic receiver array that is used for tracking the movements of marine animals. The southern part of Jervis Bay makes up the Booderee National Park, which is owned and managed by the Wreck Bay Aboriginal community. Thanks to the efforts of the management authorities, the waters of Jervis Bay and Booderee are a biodiversity hotspot, as beautiful above the water as it is below. Bendalong, a little south of Jervis Bay, is famous for the big smooth stingrays and eagle rays that frequent Boat Harbour beach looking for a feed of fish from fishers and the public. Each year, hundreds of tourists visit the beach to feed the rays by hand. Compared with the scavenging of fish scraps occurs in Jervis Bay, the rays of Bendalong experience quite a high level of feeding, but still less than that done for tourism level provisioning. Boat Harbour beach is therefore a great comparison site to assess the impacts of food provisioning on smooth stingrays at a smaller scale. Overall, the Jervis Bay and Bendalong region is an excellent study location for The Stingray Diaries project, based on the large population of smooth stingrays, their exposure to food provisioning and the existing infrastructure (acoustic array) within Jervis Bay. It also provides a great opportunity to collaborate with Fisheries NSW and the Booderee Management Authority. Identify potential risks experienced by smooth stingrays in south-eastern Australia. Identify other risks provisioned rays may experience from their affinity for scavenging fish scraps in these high human use areas. Acoustic telemetry is a method of tracking animals 24/7. Animals are tagged with an acoustic transmitter, which sends out a unique signal that is picked up by acoustic receivers, which are like listening stations. When a tagged animal swims with range of a receiver (~300m) the receiver logs the time, the location and which animal it was. How acoustic telemetry works. When a tagged animal swims within range of a receiver, it logs data in which animal, where it was and when it was there. In Jervis Bay, there are over 50 acoustic receivers around the perimeter of the bay, across the mouth and at our locations of interest for provisioning. We can therefore track smooth stingrays around the bay and know when they leave and return. In collaboration with the Integrated Marine Observing System Animal Tracking Facility (IMOS-ATF), the Sydney Institute of Marine Science (SIMS), and two projects from the University of Wollongong, we have also installed 10 acoustic receivers along the coast in the Bendalong region, from Berrara in the north to Cunjurong Point in the south. To date, over 20 smooth stingrays have been tagged and tracked in Jervis Bay and Bendalong. We will upload some tracks from these animals shortly. To conduct genetic analysis, we collect small samples of muscle and slime from smooth stingrays. From these samples, we can look at the relatedness of the individuals, estimate size of the population in the region and determine if there is any mixing between the Jervis Bay and Bendalong populations. Stable isotope analysis based on the idea that you are what you eat. Different prey items have different isotope signatures in their tissues and these also differ with their trophic level (e.g. primary producers to apex predators) and their distribution (e.g. temperate to tropical). When an animal eats these prey items they adsorb these isotopes into their tissues, but this occurs at different rates depending on the tissue. For example, isotopes turn over faster in blood than in muscle, so isotope signatures taken from blood with reflect was an animal has recently eaten, whereas isotope signatures from muscle will give an indication of an animals overall diet. Using the muscle and slime samples we take from the smooth stingrays we hope to determine the overall diet of smooth stingrays, which remains largely unknown, and for the rays that are provisioned, we hope to determine what proportion of their diet is made up of provisioned food. 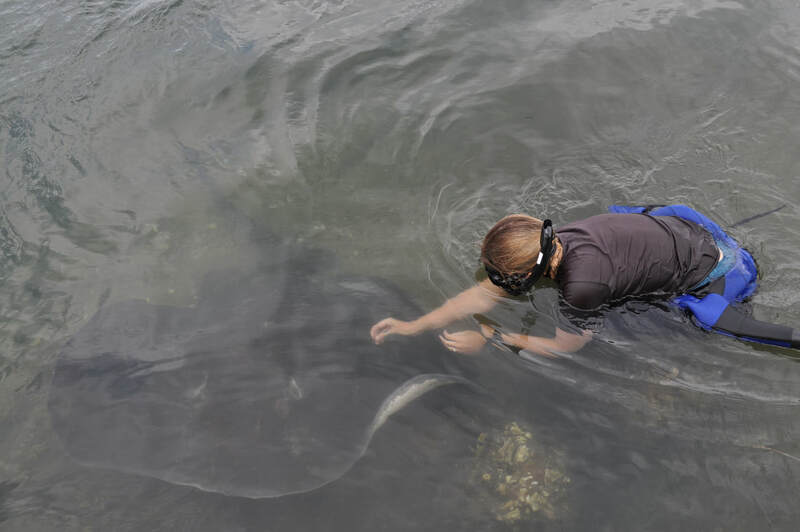 Collecting a slime sample from a smooth stingray. Want to know more about The Stingray Diaries or how to get involved? ​We want to know about it!